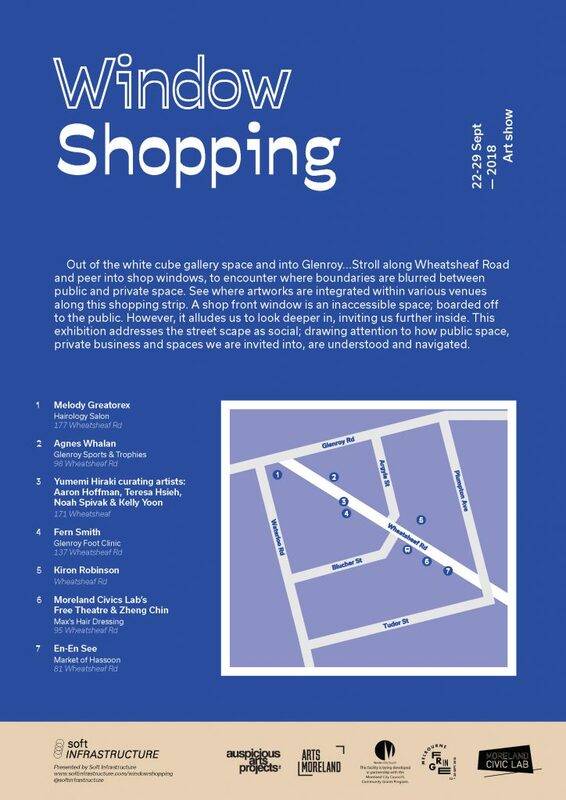 “Contemporary Artists, Architects, local business work together to produce an art show in the suburban shops and in the public space of Glenroy, Wheatsheaf road called Window Shopping. This exhibition addresses the streetscape as social; drawing attention to how public spaces and private business are understood and navigated. Artists collaborate with local business to create artwork that is subtly positioned inside the store, Agnes Whalan works in Pronto Trophies using the objects in shop to create music. EnEn See works to create installations as an alternative way to display products at Market of Hasson and produces imagery with herbs and spices from the store. Free Theatre & the Moreland Civic Lab team bring their theatrical and civic practice to a Neighbourhood Chats event. A dynamic interview space will be set up in front of Max’s Mens Hair Stylist. Fern Smith recycles paper for Glenroy Foot Clinic to carefully constructed feet placed back into the shoes sold at the clinic.